So funny - Love the way this boy thinks. My 5 year old is at the perfect age to read this book to. I like this series. It a neat way of explaining expressions to children. Also they help children understand different sayings and what is meant by them. I would definitely use this story in my classroom. I liked it, but it didn't work so well as a read-aloud. My literal-minded five-year-old was shocked and unamused at the thought of a boy losing his body parts. We won't be reading this one again for a few years. This was a very amusing book because it was about a child who didn't understand any idioms, so he took everything very literally. This would be a fun way to begin talking about metaphors in writing and would lead to a good discussion about how we use idioms in our everyday language. I think students would be very entertained by this book and would want to learn more idioms. Very funny book. This book is relatable to almost anyone, adults, young chilren. The book has a boy who is confused about some of the phrases his parents use. Such as, "That must've broken your heart". This he takes literal and wrecks his mind trying to think about what his heart is actually doing. It is a silly book and I would highly reccomend reading it to your classroom. I love how this book was a rhyming book. As an adult, this book kept me wondering what was going to scare him next and what he was going to do. The over exaggerate pictures made the illustration even more interesting. I enjoyed this book a lot and would recommend. Humorous exploration of idiomatic expressions involving body parts. Funny illustrations of common expressions that might confuse children are included and offer a great opportunity for parents to discuss their meanings since the book doesn't explain the expressions for the reader. Genre: contemporary realistic Reading Level: lower elementaryThis book was quite humorous. The boy in the story took everything literally such as “give me a hand” and thought that meant to literally give up his hand. I️t was a fun story. This is another good resource for teaching idioms. Just as good as the first book. Just as cute as Parts. An excellent play on words. Really makes you think about the things that we say that could be misunderstood. Very interesting! Could be used in a lesson about hyperboles or idioms. Cool illustrations. Could be good for an interactive read aloud. Super funny and a great way to teach different expressions to kids. This book is adorable. Children can relate to this book because sometimes as little people you just don't understand what grown ups are talking about. I loved this book! Fun and silly read aloud book. Good to read to students to help them realize that some things are said with the intent that that are not to be taken literally- Screaming her lungs out, etc. Good vocabulary and nice illustrations. More Parts was a second book for the books Parts. I really enjoyed this book about a young boy that takes figurative language literally. My favorite parts of this book was when his dad said, "Give dad a hand." The boy thought that his dad really meant for him to give him one of his hands and he went wondering about how awful it would be for him to take one of his hands. Another one of my favorite parts in the story would be when they told him they had a joke that would crack him up and that he better hold his tongue. This scared him into thinking that his body is going to fall apart. At the end of the book, his dad ended with saying that he's scared the boy might've lost his mind. I would have this book in my future classroom library for the students to have access to at all times. I would also use this book for a read aloud for a writing assignment when I want the children to learn more about figurative language. I think this would be a good read aloud for first grader through third graders when they are trying to understand figurative language and understanding when people don't mean things literally. I really enjoyed the illustrations in this book. I think they are really detailed and really catch the readers attention. I think that they help tell the story because they show what the boy is thinking and what he would really look like if what the figurative language was real. I enjoyed this book. Brief review- This is a fiction story. The age group this story is made for is 3-7. I liked in this book how it teaches language in a fun way. I would have liked it a little more had they added in some details to set the boy straight. They also use a lot of rhyming to tell the story.Content area- A content this could be used in is English because it is figurative speech. You could teach the kids what figurative speech is. Then you could read the book and discuss the figurative speech. An lastly you could make an activity where they had to act out a piece of figurative speech. For example a broken heart. 2 questions-What was the boy confused about? Use examples from the story.A. Parts of speech, He thought they literally were going to stretch his arms long when they were talking about stretching.Have you ever heard someone say something like "losing their mind?" Explain. A. Yes, my parents say they are losing their mind when they lose items. 2 wonders-Why did he not understand the figurative speech?Did the boy ever learn? This book is disturbing. I can't understand the appeal of it for the life of me...my kindergartener brought it home as his nightly read-to-me book choice, then wouldn't let me read it to him because "it's too scary for bedtime." A little confused, I picked it up and leafed through it, only to see people's faces cracking to pieces as they laughed ("cracking up") and a baby's lungs flying out of her mouth ("crying her lungs out"), among other gross literal interpretations of figures of speech, all concerning body parts. The illustrations were frightening enough for me--no wonder my five-year-old was terrified! I asked him why he brought it home and he explained that he had read it at school and that it was "stuck" in his head. He wanted to see if I thought it was scary, too. Indeed. It will probably be stuck in my head, too! 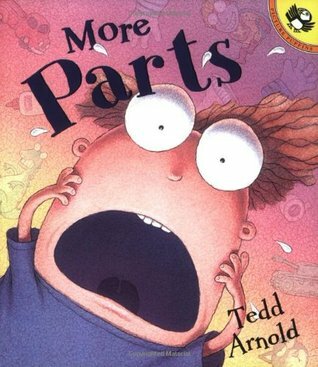 More Parts is a hilariously written and illustrated story about a child’s literal interpretation of commonly used expressions. I used this book to introduce idioms to my first grade students. The writing and illustrations in this story are amusing and clever. Children will be able to relate to and find a great deal of humor in the main character and his absurd reactions to the various idioms the adults around him utilize. This story can be used as a read aloud or to engage elementary age students in shared reading. It is a fun way to talk to students about idioms. After I read my students this story, I had them come up with some other examples of idioms they may have heard friends and family use. I also shared some examples of my own. The students then created, recorded and illustrated their very own idioms. This book (along with the others in the series) is truly funny! I had so much fun reading this one, which happened to be the first one I read of the series, that I went in search of the others. They didn't disappoint. We had a great laugh reading these one morning at the library.In this one, our young narrator is horrified by what he hears when he takes idioms literally. Imagine his alarm when his father asks him to "lend a hand" or being told that a joke will "crack you up." This will be a great read aloud with the funny text and great illustrations. It would be a great tool to use with school-aged children to teach them figurative language and what idioms are. A boy becomes increasingly worried as he hears his parents, neighbors, teachers, and friends say things about his body coming to pieces. Broken hearts, cracking skin, giving up limbs...it's worrying stuff! Eventually, his parents explain that these phrases are just figures of speech and he doesn't need to worry.A very humorous look at the literal meaning of various common American idioms. Would be a great book to use when talking about idioms and other such figures of speech, especially for ESL students. The illustrations showing the measures the boy comes up with to protect himself from all the impending dangers really make the book. The nice rhyming text is well done too. I had many laughs while reading this book. A boy is so confused about all the crazy things people say. The takes everything very literal. His dad asked if he "would please give hime a hand." This scared the boy; he didn't know his hands could come off. The boy was also afraid he would squeeze his tongue too hard and it would fall in the dirt when his grandma said, "Hold your tongue." All the things adults say can be confusing to little children. We need to keep that in mind while talking to them. Adults may understand, but children may be confused. This book was so interesting! The author had a play on common saying, such as give me a hand, and this is the second book from the series, followed by the third and final book. This book is definitely geared towards older students, who would understand the puns and find them enjoyable. I wish I had ran into this book earlier, to show it to a first grader I had met in an observation setting. He was such a brilliant first grader and I know he would have enjoyed the play on words. Tedd Arnold did a great job at writing this book, and I would love to have it in my future classroom. Tedd Arnold - Tedd grew up with three brothers. His family lived on a farm in Pennsylvania for several years then returned to Elmira until Tedd was ten years old. His father's work then required that they move to Gainesville, Florida. There, Tedd's first art lessons in an abandoned dentist's office over the Happy Hour pool hall eventually led to a fine arts degree from the University of Florida.He and his wife, Carol, started their family in Tallahassee where Tedd worked as a commercial illustrator. Carol, a kindergarten teacher, drew Tedd's attention to children's books. Their first son, Walter, inspired his breakthrough picture book, NO JUMPING ON THE BED!.He and his family now live in Elmira. His second son, William, now stars in NO MORE WATER IN THE TUB!, a sequel to his first book. He has now published over 50 books as author and illustrator.